Spectacular views across North Somerset and the Mendips made Dolebury Warren the natural choice for an imposing Iron Age hill fort, built 3000 years ago. 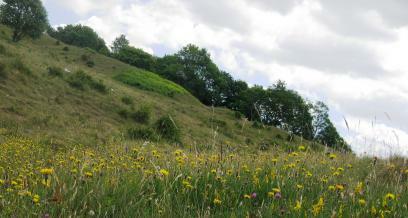 Today, wildflowers carpet the grassy ramparts and hill slopes, attracting rare butterflies. You will find small scabious, early purple orchid and eyebright flower in the limestone grassland which covers the summit and slopes. The unusual mixture of wildflowers makes this a nationally important site for wildlife. 'Lime-loving' plants like rockrose flourish alongside such 'acid-loving' plants as bell heather, which survive on patches of acidic sand blown onto the site during the ice age. Late May to August is the best time to see wildflowers and butterflies, including small blues and marbled whites, but the spectacular views will be enjoyed whatever the season. The visible remains of Dolebury's past include the imposing double ramparts of an Iron Age hill fort and a medieval rabbit warren. Dolebury Warren is an SSSI. Avon Wildlife Trust manage the site, t is owned by the National Trust and managed by Avon Wildlife Trust. Love Dolebury Warren? Join us as a member to protect our region's beautiful wild places and add your voice to our growing 17,500 strong membership, from as little as £2.50 a month. Very steep access, steps and paths can be muddy. Strenuous in places. No suitable access for wheelchairs or pushchairs. Some gravelled paths and steps, but strenuous in places. No suitable access for wheelchairs or pushchairs. Small car park off Doleburrow Lane, near main reserve entrance. If busy, it can be hard to turn around in the lane, so it is not suitable for very large vechicles. The lane can also get very muddy in winter.